Lifelike representations of botanicals are sought after for their beauty and ability to educate. Trailer McQuilkin’s masterful wildflower sculptures, created with sheet copper, copper wire, metal primer oil paints and natural materials offer a unique experience into viewing natures minute details. A magnifying glass is not required for seeing the tiniest fibers or vein work on the leaves or the imperfections caused by insects. One is mesmerized by these carefully crafted, realistic plants sculptures which expose their fragility while capturing them for posterity. 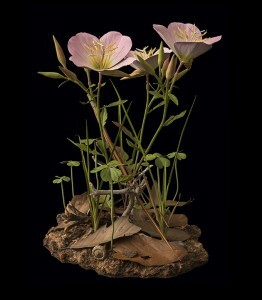 McQuilkin’s work references in quality of detail rather than its medium The Ware Collection of Blaschka Glass Models of Plants (or Glass Flowers) at the Harvard Museum of Natural History in Cambridge, MA. They are perfectly aligned for the exact manner in which they convey the plant structure. 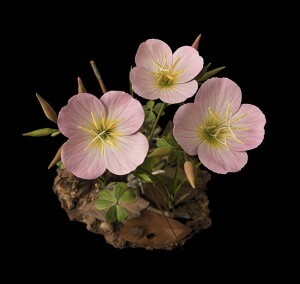 The Glass Flowers were created in Germany and sent to the US over a 49 year period from 1886-1936. McQuilkin’s plant sculptures take 2-5 months to complete. While the Blaschka’s Glass Flowers are housed in a museum’s collection, McQuilkin’s work is available to collect. Each piece comes with a handmade Plexiglas cover for its protection from dirt and likelihood of damage if exposed in a crowd. The cover is easily removable for special display. Please visit the home page of my website to view this special, limited time offer. 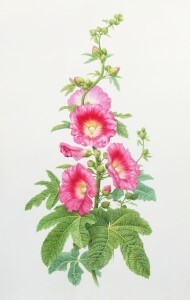 Roses in Bloom: Contemporary Botanical Portraiture at Susan Frei Nathan Fine Works on Paper, LLC. Presented on our website is a selection of Roses by various artists with dramatically different stylistic interpretations. Joined together on the home page we can appreciate the pure beauty of the rose as we celebrate the upcoming months when they are in full magnificence. These botanical watercolors provide the ultimate satisfaction of seeing the flowering rose at its peak and the opportunity to appreciate it all year round rather than only in its fleeting month of bloom. Prices range from $1000-$4200. As carefully composed plant portraits captured in real time, we gasp at the sheer elegance of the subject, its complex make-up and the technical mastery of the artists hands in controlling the information from the plant, to paper or vellum to viewer. 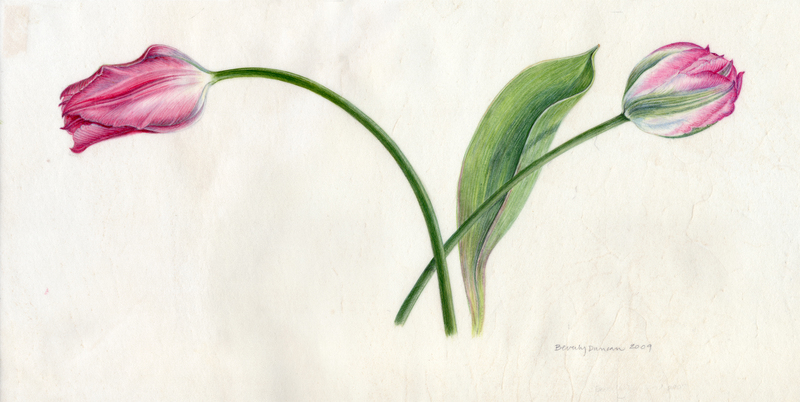 This lengthy study of the plant reveals the devotion and dedication of the artist to secure its integrity. The results are of the highest quality and beauty. Here is a unique opportunity to acquire two works from an earlier time in Nessler’s artistic production. 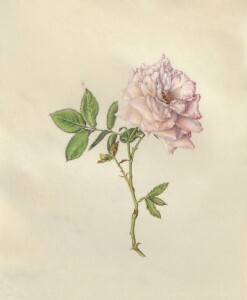 Renewal, 2014 and Pink Roses, 2012 are quintessential examples of works where the artist’s in-depth exploration of drawing and painting techniques come together in magical ways within the painting. Nessler has captured nature’s spirit and beauty in its truest form. This realism transports one to a place we never want to leave and long to return. 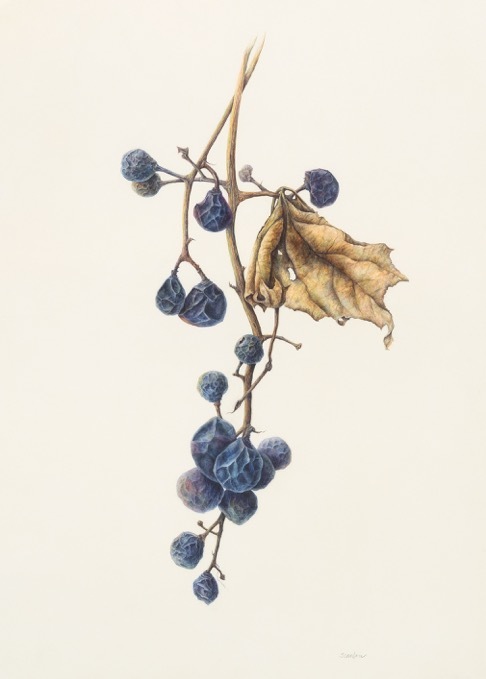 Botanical artists like Kate Nessler, who work from real-life specimens, understand nature is about those moments. 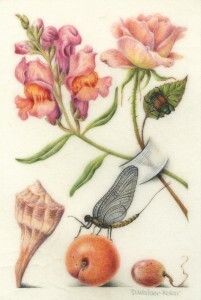 The magnificent Joris Hoefnagel-inspired paintings by Denise Walser-Kolar pay homage to one of the greatest European natural history illustrators working in the 16th century. Perhaps Walser-Kolar’s European lineage has strong links to her appreciation of Hoefnagel’s work. Her contemporary paintings of plants and insects reflect her passion for gardening within her part of the midwest. She finds beauty wherever she roams and takes specimens from her friends who know and appreciate her specific interest and aesthetic which she often incorporates into her designs. 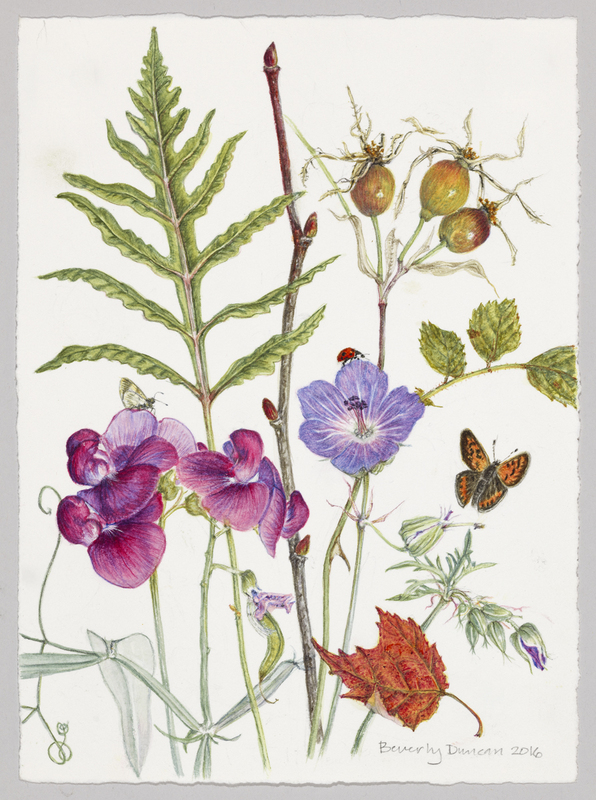 In Walser-Kolar’s Hoefnagel-Inspired #12, the snapdragon and rose specimens are from her garden as well as the Japanese beetle (which loves to nosh on her roses). The shell is from Sanibel, the Mayfly is from a friend and the apricot and grape are from her local Trader Joes. 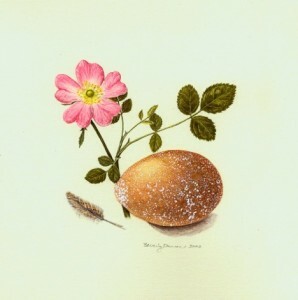 Her degree in graphic design and commercial illustration informed her confidence in combining these elements while her velvet painting technique touches on her romantic treatment of color tones and texture, surely a European trait. 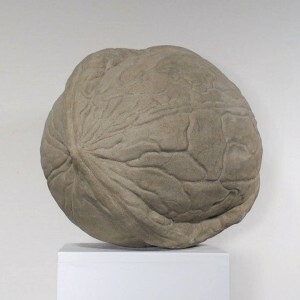 The nature-based sculpture of CA Johnson, made from reconstituted limestone, allows the artist to obtain wonderful details which highlight the realism of his subject. As a garden furniture restorer, Johnson comprehends the historical techniques employed in antiquarian art. As a 21st century artist, he has thought about sculpture today and transformed how we think of the medium with his unique choice in material. As both indoor and outdoor sculptures, this medium enables the client to move these hollow pieces with ease, ensuring the collector can appreciate them in many areas of the home. His wide range of subjects in nature brings a lot of variety and choice to the client. Please visit our website for more works. Susan Frei Nathan and ILevel invite you to an Open House, Saturday, December 3 for 12-5pm at ILevel Studio, 37 East 7th Street. 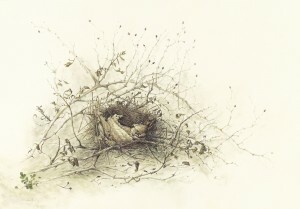 Please stop by for hot cider and donuts while enjoying contemporary botanical art. Susan Frei Nathan will be on-site all afternoon and looks forward to discussing the art. 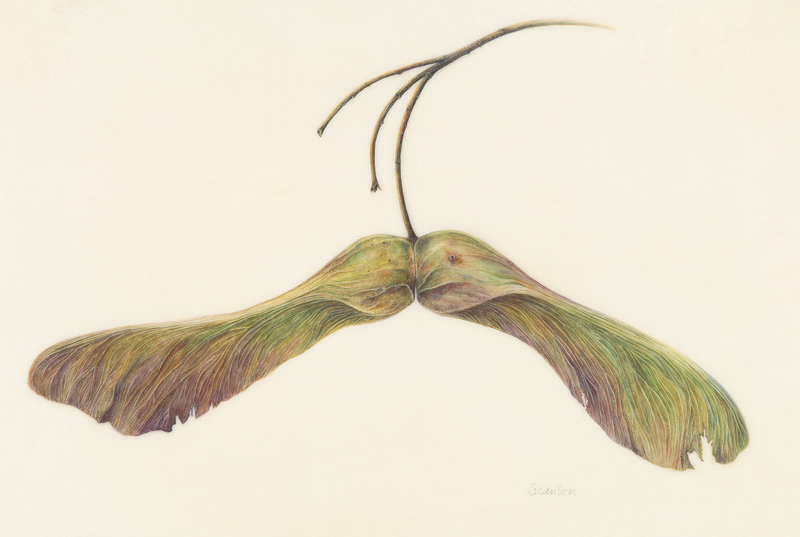 Connie Scanlon’s botanical art portraits are like magnets to the eye. She has enormous talent and great patience with the subjects she paints, as seen in her Norway Maple samara. 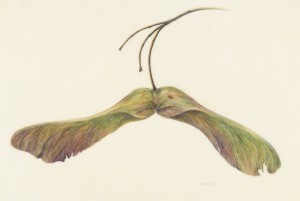 As Scanlon sees it, ”the delicate strength of the veining, ridges and shadows of this small yet magnificent element of the maple tree”, is mindfully extracted through her dry brush watercolor technique. Here she is pointing to subjects in nature often overlooked. Sourced plant-life like her recently painted Riverbank Grapes, capture its trailing vine by magnifying it x 3 , showing its range of coloration (common throughout her works) with elegance and abundant grace. This viewing satisfaction lingers on the mind like all great compositions, shifting our attention to often stepped on or brushed by specimens in nature. Scanlon masterfully pulls us in to revel in their non-traditional beauty. As you peruse the Spring-Summer online exhibition, I hope you enjoy the moments when the blooms beckon you. Nature’s pure glory is within these moments where we connect with its beauty, frailty, vulnerability and grace. Nature takes it’s time to present itself, the artists here have captured the moment where nature fully exposes itself for all to see. We turn inward at that moment with pure wonder about earth’s manifestations. 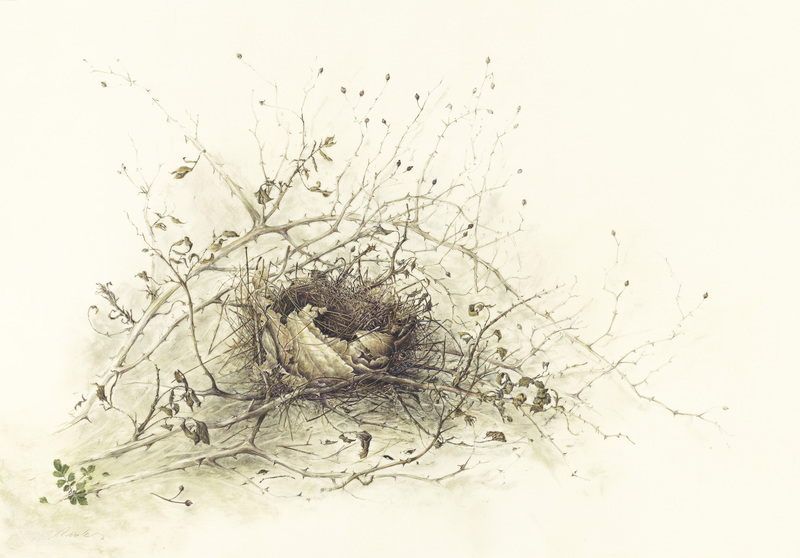 We build botanical art collections around these moments which are personal and surround the collector with a lasting memory. Presented are a few of Beverly Duncan’s jewel-like paintings especially for Mother’s Day. These pieces were selected for this event only. We hope you consider adding a work to her interior garden for this occasion.